Who fans willing to part with a good chunk of change can get their hands on some original band gear through an online auction being conducted by Lelands.com. The auction that concludes on July 25 includes a Pete Townshend Gibson SG played during a Who concert in Cleveland and the drum stool, timbale drums and a cymbal that wer part of the drum kit Keith Moon used while recording his final album with the band, Who Are You. 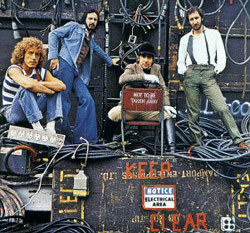 The red Gibson was gifted by Townshend to Cleveland DJ and future Joe Walsh manager David Spero. The SG comes with a case and a letter from Spero authenticating it as having belonged to Townshend and detailing how he acquired it.